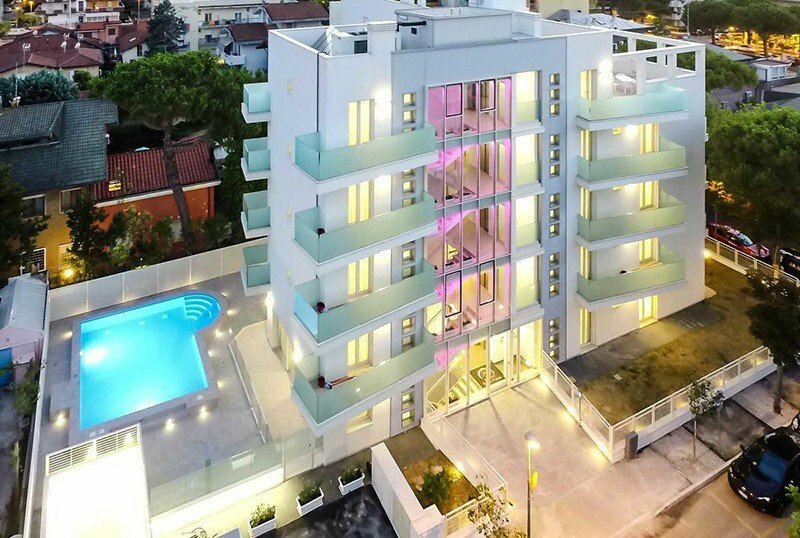 The Residence Perla Verde in Riccione, 3 stars pet friendly newly built, has a swimming pool, fitness area and parking. The apartments, two-room and three-room apartments able to accommodate up to 6 people, are well furnished and equipped with balcony, WI-FI and air conditioning. The property is located in Riccione in a quiet position, less than 5 minutes walk from the beach and about ten minutes from the canal port. Two-room and three-room apartments are available that can accommodate from 2 to 6 people, with a living area, kitchen with fridge, stove, dishwasher and microwave. They have a bedroom, a balcony, a bathroom with a shower cubicle, a hairdryer, towels and bed linen, a safe, a TV, a telephone, individually regulated air conditioning and free WI-FI connection. Daily reorder can be requested for a fee. Two apartments have a garden. Opened in 2017, the property features a garden, swimming pool, hydromassage, open-air porch, sun terrace, free bicycles, reading room, fitness area, lift, laundry service. PARKING: 2 uncovered parking spaces in a residence and a garage with 16 spaces, both free. AIR CONDITIONING: present in all apartments. CONVENTIONS: beach, amusement parks. On request: shuttle service, organized excursions. SERVICES FOR DISABLED: entrance on the ground floor with sloped ramp, lift for disabled people, room with wheelchair maneuvering space, bathroom with shower accessible by wheelchair and special chair. PETS: small pets allowed (except cats) with supplement, upon notice at the time of booking. In residence: children's pool, pediatrician on request. In the apartment: cot, high chair. The residence has a 100 cm deep outdoor swimming pool with hydromassage and bubble jet. The pool is surrounded by sun loungers, plus a 5-seater hot tub. The structure has an agreement with the Spiaggia del Cuore n. 110, equipped with heated pool, hydromassage, entertainment for adults and children, massage area, children's library, mini club, playground, nursery and changing table, table tennis table, facilities for the disabled, reading area, identification bracelet for children, beach towels rental, beauty center and massophysiotherapy. List prices are per week from Saturday to Saturday. - Small pets are allowed on request in the Residence, with payment of the supplement of € 9.00 per day. - Mandatory final cleaning: € 55.00 per studio; € 65.00 for 6 people. In case of presence of animals (on request) the cost of cleaning will be doubled. -The reservation can be made by phone or email and will be definitively confirmed by the structure. For stays of several weeks, the Residence reserves the right to request a deposit of a higher amount. The amount must be received no later than 3 days from the date of booking, save several agreements. Failure to comply with this condition authorizes the Residence to cancel the unconfirmed booking request. -Caution: € 250.00 which will be returned upon return of the property that must be in the same condition in which it was delivered: any damage will be retained by the security itself, at current prices, unless more expenses that the guest will be required to pay. -Eventual loss of keys or access cards, must be promptly reported to the property. The loss will result in a refund of € 20.00 from the customer.